Spoiler Alert: If you have not seen Season 5, Episode 5 "Kill the Boy." Do not continue reading. Spoilers ahead! Grey Worm lives! He's okay! Not only is the Unsullied commander alive and well, but he finally told Missandei how he felt about her. Favorite "GoT" couple? Yep. Daenerys has a Mother's Day barbecue What happens when you piss off Daenerys Targaryen? Besides chopping your head off, she'll throw you in her dungeon for her dragons' dinner. After saying that a mother will never abandon her children (in a perfectly-timed Mother's Day moment) Dany then lets Viserion and Rhaegal roast one of the leaders of a Meereenese family. Hizdahr zo Loraq is one of the leaders that is nearly killed, but later Dany comes to her senses and realizes she should follow his advice and reopen the fighting pits. Oh, and she also asks tells him to marry her. Get ready for another (bloody) wedding this season. Jon divides the Night's Watch Jon Snow is a good guy, but good guys aren't always well-liked. The Night's Watch commander divided his brothers in Sunday's episode when he decided to free Tormund and offers to protect and fight alongside the Free Folk. The only problem now is that Jon has to travel North of the Wall and convince the Wildlings to actually accept his offer. Jorah gets infected While passing through the eerie, yet gorgeous ruins of Valyria, Tyrion spots Drogon flying overhead, which is a sure omen of danger to come. Moments later a group of Stone Men attack Tyrion and Jorah's boat. Jorah fights them off and saves a drowning Tyrion, but ends up being infected by greyscale, which is the same disease Stannis' daughter Shireen was infected by. Shireen was luckily treated in time before it completely disfigured her, but it seems unlikely Jorah can be saved in time. Stannis vs. Bolton begins An epic war is commencing now that Stannis has begun his march South to take Winterfell from Roose Bolton. Stannis -- who we learned is quite the grammar obsessive -- may have Melisandre on his side, but Roose's hunger for total annihilation shows no bounds. In other Bolton news, "Fat Walda" is also pregnant with Roose's baby, which cannot be good. 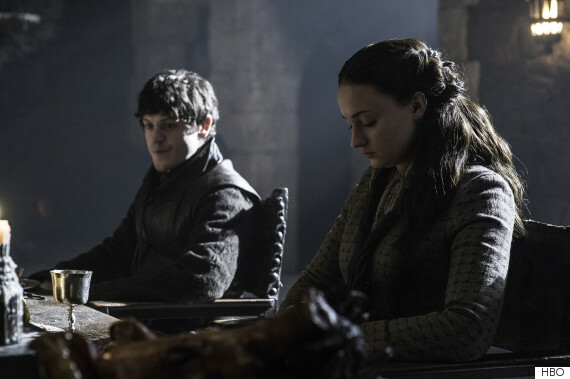 "Game of Thrones" airs on Sundays at 9:00 p.m. ET on HBO.